So it’s time to make frozen everything, you guys. It’s too hot! It’s almost too hot to crisp up tortillas. It’s even almost too hot to make a salad! So let’s eat popsicles in the backyard. Every. Single. Day. Let’s lounge directly in front of a fan and read magazines. Let’s just chill out, literally. P.S. I’ve made fudgesicles before. I wanted to re-make them coconut milk though. Because you see, I’m obsessed with chocolate coconut milk ice cream. And because I want to be able to eat two a day, ya know? P.P.S. I took next week off work! Rumor has it, it won’t be as hot. I want to make brunch every day and nap every afternoon! Place the coconut milk, chocolate, and espresso in a saucepan and heat until chocolate is mostly melted. Set aside for 5 minutes for the coffee to steep. Strain mixture through a fine mesh strainer and toss the grounds. Stir in salt, vanilla, and sugar. Taste and add more sugar to taste. 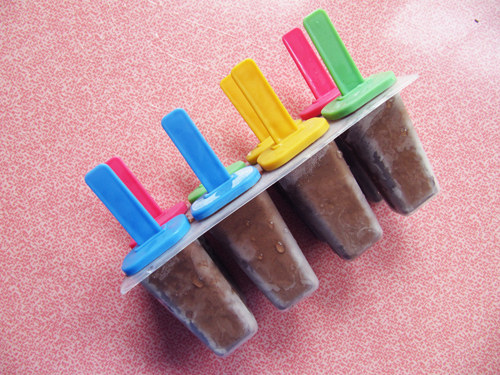 Pour into popsicle mold and freeze for a few hours or over night. When ready to eat, run the mold under warm water. If you pull a stick out sans pop just run it under water and place back in the popsicle to freeze. *This should say that I complicated things since her pops were just 2 ingredients, but I’ve had espresso fudgesicle hopes and dreams! 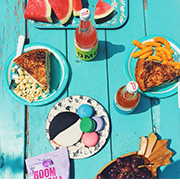 Feel free to taste and flavor however your summer-time heart desires! This is my dainty little popsicle mold from the Target dolla holla section. these look BONK. I’m gonna make them for coops sans espresso because that would be NUTS watching that boy on coffee. I imagine it would be like Charlie Sheen, yo. Thanks, grrrrl! haha I bet little Cooper would love these! Your week off plan sounds magic. Heck, these popsicles are a reason to take a week off, as far as I’m concerned. 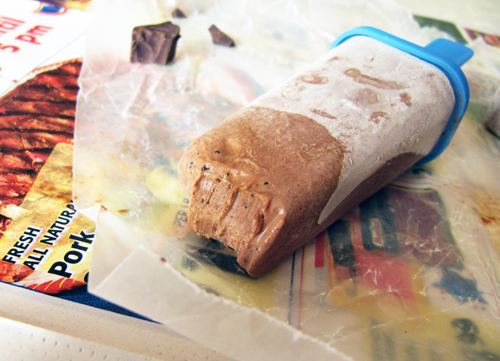 Long live frozen fudge desserts. 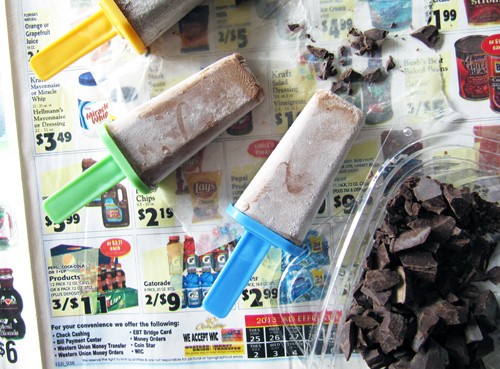 I need some Popsicle molds and then I need to make these for all my dairy free friendlies. They would die over them! Thanks, Lauren! You should totally peruse the dollar section at Target for some popsicle molds. just go on the frozen goods and grapefruit beer diet! it’s probably a real thing. and you pop molds are cute with those rainbow sticks! Oh, I’m totally on that diet. You are slam dunkin’ it with these girl!! I need these in my life! They look like the BEST fudgesicles. You’re right, it is too hot to make a salad. I’m so glad it’s cooled down! I love you! Be right back…off to make these right now. I can’t believe how simple they are! I wonder if I can find that beer here. In other words, I’m making it my life’s mission to find that beer this weekend. 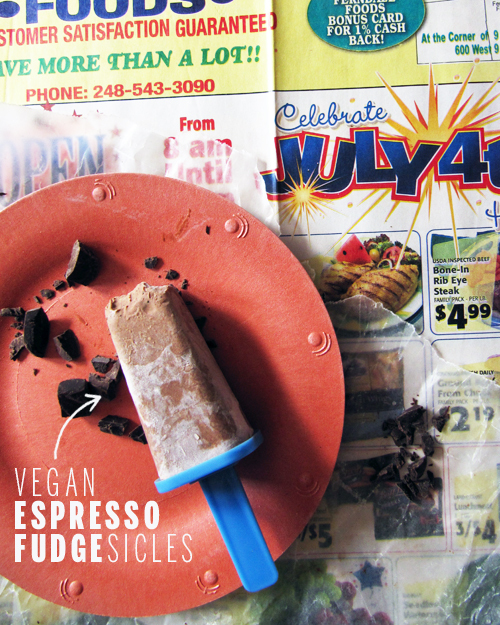 These espresso-fudgesicles might need to happen today because we have a heat wave happening in San Diego. I won’t complain, because I know it’s normal for you guys. I hope you can find it! It’s a Texan brew. And man-0-man, these are totes a dream for those toasty days. Dang these sound awesome! Might have to make these for 4th of July! I’m about to bust out the pop maker now!!! Boo-yah! Ice cube molds would work, I bet! These look so good. 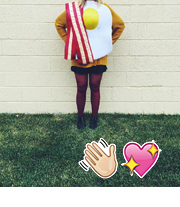 I’m jealous of your cooking ability.